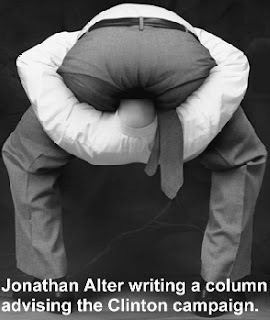 After advising that "Hillary Should Get Out Now" in a column last week, Jonathan Alter is frantically patching a leaky argument before potential Clinton wins in Ohio and Texas tonight put a couple of torpedoes below the water line. In his most recent column "Hillary’s Math Problem" he says to "Forget tonight. She could win 16 straight and still lose." Alter's problem is not math. It is word comprehension. The problem with his thesis is that he conflates a lead in pledged delegates with "the will of the people". The pledged delegate total is many things, but the one thing it is not, is the "will of the people". The pledged delegate lead is polluted by many and significant non-democratic elements in the peculiar byzantine Democratic Party nomination process. Among these are: Caucuses that have absolutely nothing to do with the "will of the voters" in their states; Weird delegate allocation rules like in Texas that make some voters more equal than other; Ignoring all of the voters in two of the biggest and most important states in the union. The pledged delegate total is certainly important. Very important. It could still be decisive if Obama closes the deal in either Ohio or Texas. But ultimately it is just one piece of data, and has little more inherent validity or claim on the "the will of the people" than the preferences of the superdelegates. If the undemocratic superdelegates reverse a narrow undemocratic pledged delegate lead, well - that is the way the game is played. Clinton did not make the rules. If Obama fails in Ohio and Texas then he failed to render the superdelegates moot. And there will be no party "suicide" and no disunity if the superdelegates mandate Obama as VP at the same time as they install Clinton as the nominee. Better get started on next week's column Jonathan. more frequent posting ! this is your season. "Clinton did not make the rules." No, but her husband and Terry McAuliffe did. Those same rules also say the race is decided by PLEDGED DELEGATES. Actually Anonymous, you are completely wrong on both counts. Fortunately your anonymous status will save you from the public humiliation of being so ignorant on these issues. In case would like to remedy your knowledge deficit before commenting further you can get a good overview of Democratic party delegate and convention history and rules on sites here, here and here.